Many people ask themselves..."Should I? Shouldn't I?" The economy is better now than since the recession of 2008. Money is beginning to flow again. You don't need others' opinions; you need to do a bit of homework, first. Set yourself up for SUCCESS in your restaurant, bar, cafe, pizzaria or other food service venture. There's more to owning a restaurant than cooking or counting the money at the end of the day. To be truly successful FOLLOW THESE INSTRUCTIONAL STEPS BEFORE you sign anything, such as the lease, or the loan documents, or the partner contracts. Unless you do your due diligence – "count the cost" – months or years before you think you will open, then you will find yourself struggling to stay in the business. Do your HOMEWORK. You ask, "What do I need to know? What do I need to do? When? How do I gather information? Who can advise me?" Frank Stocco can get you started. He is a food service consultant, restaurant designer and author of this book which comes straight from his years of experience, successes (and failures) in the restaurant business, and wealth of education. 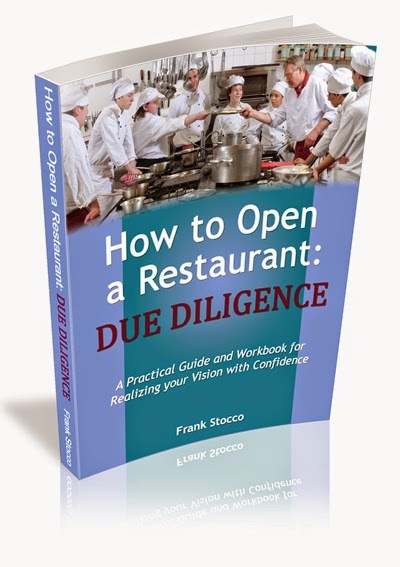 How to Open a Restaurant: Due Diligence, is a MUST READ and a MUST DO FIRST, for SUCCESS in the food service business. Frank wrote this book as an instruction guide... It's a valuable tool for a little bit of money. ORDER YOUR BOOK NOW at a discounted price until Edition 2 comes out. Here's to your food service business success!